Thomas Edison built the first electrical distribution system in 1882, delivering electricity from his Pearl Street Station in Lower Manhattan to nearby customers - and giving birth to the centralized electrical system. More than 130 years later, the confluence of low natural gas prices, high electric rates and the need for resilient power is motivating many commercial and industrial customers across the United States to return to Edison's original concept, where power is generated closer to where it is used. The drivers for this trend of on-site generation are perhaps strongest back in Edison's original test city of New York, where a combined heat and power (CHP) renaissance is underway. The types of customers who can benefit from CHP - which produces power and heat on-site - are as varied as there are personalities in New York City. Currently, CHP projects are under way at hospitals, apartment complexes, industrial facilities, data centers, and universities, to name a few. Sometimes called cogeneration, CHP is not a new concept. 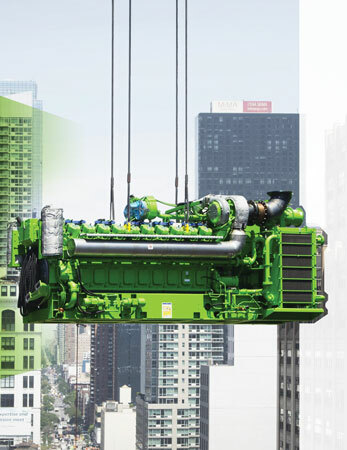 GE has delivered more than 8,000 MW of gas engines in CHP applications around the globe. If all were located in New York City, they would meet more than half of the city's peak power needs. CHP captures the thermal energy from the engine's exhaust and cooling systems to generate additional value, often in the form of heating hot water or to supplement building cooling loads. This combination can result in very high total efficiencies, at times exceeding 90 percent efficient use of the natural gas the engine consumes. Compared to other forms of distributed power such as solar power, CHP offers the added benefits of being available when it's cloudy and at night, the capability to closely follow the electricity demand, a smaller footprint per megawatt of power produced, and the production of valuable thermal energy as a byproduct of power generation. The transmission and distribution infrastructure in North America was developed in the 20th century and is reaching a point where upgrades and reinvestment are needed, which is often paid for by higher electric rates. At the same time, gas prices in the US are at historical lows; in fact, the US just reached a 17-year low Henry Hub natural gas price. While the delivered price of natural gas in some urban centers is much higher than the Henry Hub price, the economics of on-site gas generation have never been better. Additionally, the very high efficiency of CHP plants enables a cost effective way of reducing greenhouse gas emissions. New York City has experienced severe weather events in the past few years, such as Superstorm Sandy and Hurricane Irene. In the aftermath, many CHP systems kept the lights on at apartment buildings, hospitals, nursing homes, and college campuses. Further, the creation of thoughtful policy from the New York State Energy Research and Development Authority, known as NYSERDA, both in terms of incentives and end user education, has made New York City a fertile ground for CHP deployment. Of course, the opportunity for CHP extends far beyond the five boroughs of New York City. North America's power industry is undergoing coal plant retirements, and CHP will play an important role contributing to the power needs in an efficient manner. Available natural gas, combined with high electric rates and a climate conducive to both heating in the winter and cooling in the summer, is an accelerator for the CHP industry. As a rule of thumb, if there is year round thermal needs, and the electricity price divided by the natural gas price (in the same units), results in a ratio of 3 or more, a CHP system could be economically viable. In some cases, this ratio is much greater than 3. Further, if a potential utility customer is subject to a demand charge, based on peak energy demand, the economics could improve significantly. Perhaps the biggest obstacle to CHP adoption is the acceptance of the status quo. Often, those who would benefit most from an on-site CHP are not intimately familiar with developing power generation projects or with the cost-saving opportunities of CHP. Building on-site power plants is not a core competency for most hospitals, apartment complexes or manufacturing facilities. Most engineering or facilities departments are rightfully focused on keeping their existing operations running smoothly, so taking on a CHP project is often deprioritized or seen as burdensome. After all, deciding if CHP makes sense requires both technical and economic assessments that rely on electrical, thermal and financial analyses. Interconnecting to the utility can be a cumbersome process, too; each utility has its own process for interconnection approval and detailed studies sometimes are required. Ownership models can pose additional challenges. Sometimes those who occupy the building don't own it, which then requires a broader team of stakeholders to complete the project. Finally, a building's typical operating budget is not sufficient to cover the capital expenditure needed to design, engineer and construct a CHP system, so not having access to capital to fund the project can also be a significant issue. While the macro drivers for CHP are largely in place in New York, finding ways to overcome the challenges is critical to enabling the economic savings for individual potential CHP users. Three ingredients are necessary for a successful CHP project. First, the right team needs to be assembled to deliver an integrated, complete CHP solution. The design and development team working with the building owner must be familiar with local codes and standards and have relationships and demonstrated history with experienced electrical and mechanical contractors. The team also needs to have broad and deep expertise on gas and electrical interconnections, thermal and electrical controls, building heating/cooling integration, and equipment installation. Each CHP installation is unique, and having an engineering team that can work with customers to solve their specific challenges is a differentiator. But having the right team extends beyond installation. Since many CHP systems are in place for 10 to 20 years, service providers must have similar staying power. And, since most CHP gas engines run as a baseload operation where efficiency matters, they need more specialized product support than that required by standby diesel engines running less frequently. With this in mind, technicians who are trained in maintaining gas engines, not just diesel engines, can help customers achieve optimal performance from their CHP installations. Second, the right product is needed for the job. The electrical and thermal energy needs for each application will vary significantly by project. Since there is no "one-size-fits-all" product for CHP, selecting the technology that enhances the overall efficiency and economic return for the CHP solution is critical. Some CHP applications naturally will be a better fit for a gas turbine (for example, where a large amount of steam is needed), while other applications will be a better match for a gas engine as the prime mover (for example where higher electrical efficiency is more important). An experienced development and design team can quickly assess a facility's energy uses to determine which type of prime mover will provide optimal returns. Also, for CHP projects that are islanded from the grid, or where reliability is paramount, a customer may choose to go with a less efficient engine that has a demonstrated track record of high availability and reliability. Third, the right delivery model is needed. Delivery models have to be flexible, adjusting to the end user's needs and goals. In the traditional delivery model, end users and building owners invested in and managed the CHP project themselves. Becoming more popular with customers today are energy service agreements, in which the end user pays no upfront capital expenditures and all of the initial capital, operations and maintenance costs are provided by the developer. Hudson Yards is the largest real estate project in the city of New York since Rockefeller Center and the largest private real estate development in the history of the United States. The project is transforming the West Side of Manhattan by developing 17 million square feet of commercial and residential space. While Hudson Yards has received much publicity as it pushes current thinking on building design and real estate development within the City, it also is innovating on the energy front by incorporating a 13.2 MW CHP system to help decrease energy costs and improve resiliency across the site. The CHP system will generate electricity on-site, and the heat from four of GE's Jenbacher J620 gas engines will produce hot and chilled water for the buildings. A single Jenbacher J620 gas engine generates roughly 3.3 MW of electrical power while also generating approximately 11 MMTBU per hour of recoverable thermal energy. This thermal energy comes from capturing the heat from the engine's exhaust, jacket water, lube oil and intercoolers. Engines were delivered during the summer, and the project is under construction. Nick Lanzillotto, MEP-HRY Development, Related Hudson Yards, knew the project would be challenging and wanted to select a firm that had experience executing CHP projects. "We are very excited Northeast Energy Systems has the ability to connect with our team on this project," he said. "They have worked seamlessly with our engineering teams to design and deliver a complete CHP solution on a very complex project." Jonathan Coleman has firsthand experience on the need to create a tailored CHP design for each client. As the Principal engineer at Vanderweil Engineers, he was the Engineer of Record for the Hudson Yards CHP project and is currently involved with multiple other CHP projects in New York City. "While the CHP concept is very simple, every project has its own particular set of technical and implementation characteristics which make them unique challenges," he said. "In our experience, the best way to succeed is with an experienced team that can work together to solve problems and drive the project to completion. We have been fortunate to work with team members like Northeast Energy Systems and GE on some of the most difficult projects in the CHP industry." The industry is building upon its digital industrial capabilities to help enable more efficient, reliable and cost-effective power generation. A critical aspect to this is reducing, and ultimately preventing, unplanned downtime through asset performance management applications. For example, GE's Web-based platform myPlant is a remote monitoring and diagnostics solution that allows plant owners and operators to monitor the performance of their engines remotely in real-time. In addition, it allows them to receive alerts on their phones or tablets if the engine is experiencing an anomaly. Applications such as condition-based monitoring proactively evaluate the condition of components and take maintenance action only when an actual need arises. For example, myPlant can monitor and predict the lifetime of key components such as spark plugs by tracking the sparks' performance and life over time so plant owners know if a spark plug may fail, or if they can extend their service interval. It is these developments, staged on GE's Predix* software, that can provide real-time information and unit status - and help increase value of an operation. All of the nearly 200 installed gas engines in the Penn Power Group fleet in the United States are connected to myPlant software. Penn Power Group is the parent company of Northeast Energy Systems and Western Energy Systems. As the nation moves to a grid with more real-time price signals at the distribution level, digital capabilities will be about more than reducing maintenance costs and downtime. They will also be about increasing revenue opportunities. For example, by combining engine performance data with information from the electrical grid - such as when demand (and prices) for electricity are highest - some of GE's most advanced customers are able to intelligently and quickly make decisions about selling power back to the grid. CHP, and distributed power more broadly, are at a tipping point in North America, but multiple challenges are limiting CHP from living up to its potential. To unlock the opportunity, the right team, combined with the right products and the right delivery models, are needed. It will take the combination of these factors to enable a seamless transition to CHP, yielding a lower cost and more resilient source of power for building owners. It is only fitting that this renaissance starts in Edison's old stomping grounds of Manhattan. Devon Manz is marketing and sales engineering leader for GE's Distributed Power business. Al Clark is chief executive officer at Penn Power Group. Michael Norelli is the northeast business development leader for GE's Distributed Power business. GE Water & Process Technologies today introduced a new reverse osmosis (RO) system for a broad range of applications including general industrial, power, drinking water, food and beverage, mining, refining and petrochemical industries. GE’s new PROflex* RO is flexible and robust and was redesigned to incorporate years of customer feedback to provide a cost-effective, easy-to-configure system that offers many frequently requested options.